On Memorial Day, Monday May 25th, we awoke to a gorgeous sunny day for the first of our 3 days off. What a great treat after spending the previous nice days giving TONS of lighthouse tours. 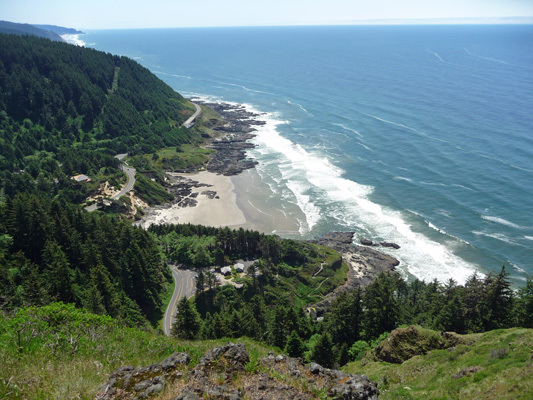 We puttered around at home for a while and then packed a lunch and headed north to Cape Perpetua Scenic Area (administered by the Forest Service). We stopped at Strawberry Hill Wayside so I could check out what it looked like. I’d sent more than one group of folks looking for tide pools up this way so it was nice to see that it had good parking and a decent sign so I hadn’t sent them off on a wild goose chase. The parking lot was full so I hopped out to take a picture while Walter drove the loop again. 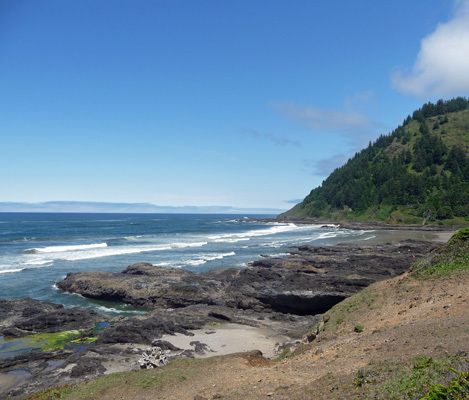 Then we continued on northward to Cape Perpetua. We found a parking spot in the lot near the Visitor’s Center (always a good sign) and went up to ask about hiking trails. On our way in the door we noticed that there was a ranger walk scheduled for 12:00 noon (only about 20 minutes away). 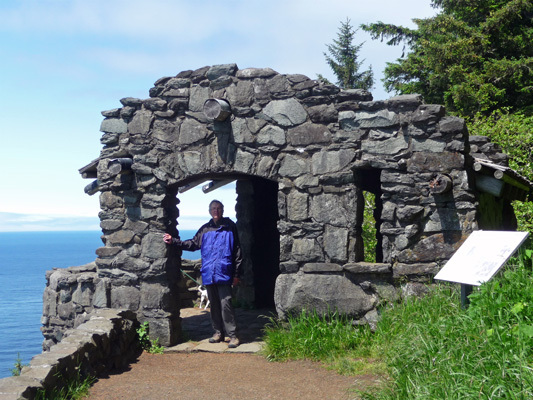 We asked where it was going and were happy to see that it was going to wind on down to the rocky shoreline and back up through the woods again for a mile or so along what is called the Captain Cook’s Trail. A perfect low key hike for a pair of weary tour guides. Our hike was led by a retired ranger who comes in once a week to do the nature walk. He was great fun and we highly recommend taking the Monday Nature Walk with Ranger Mike. He stopped and talked about many of the native plants along the way including the Silk Tassel bush which I saw last summer and wondered what it was. These are the fruit. 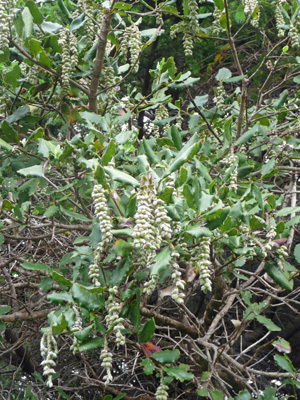 When it’s blooms it has white tassels. We wandered on down the hill towards the beach and came out near a bridge over a creek with a lovely view out to the ocean. 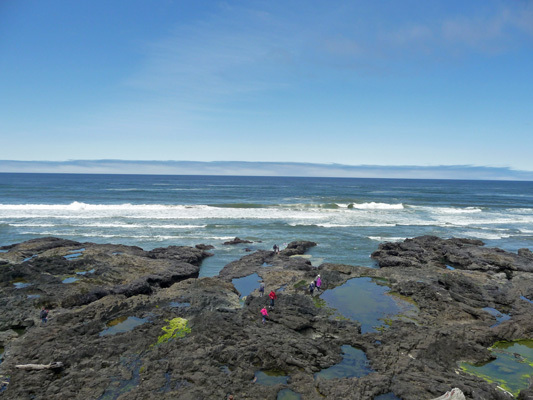 There were LOTS of folks out on the rocks exploring the tide pools since it was almost low tide. He stopped and talked about why there was so much grass growing on one side of the trail while on the other side it was full of salal and evergreen huckleberries. It turns out that the grassy area is an old native American shell midden and the shells have acted like lime raising the pH of the soil. You can see the layers of shells from down along the rocky shore. He pointed out a bunch of polliwogs that were growing in the creek water down along the shore. They will be little green tree frogs in a few weeks. 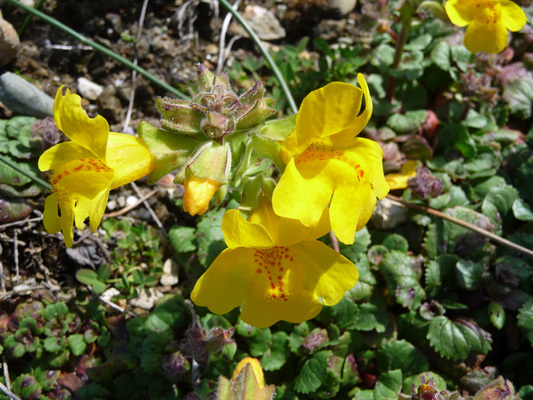 I spotted some Monkey Flowers (Mimulus guttatus) growing at the foot of this same bank. 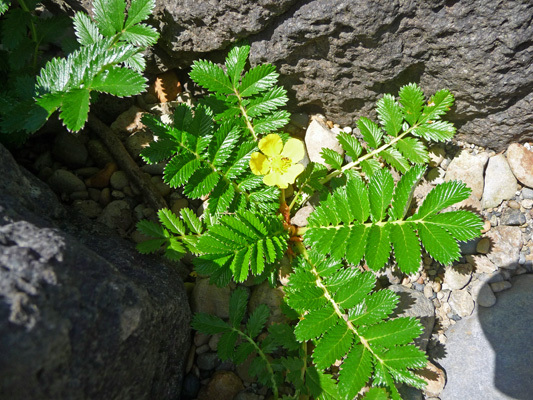 And some Pacific Silverweed (Argentina anserina) growing along the path. It definitely looks like it’s in the potentilla family. The we wound our way southward along the shoreline for a great view of Cape Cove. And on towards Cook’s Chasm. At high tide there’s a Spouting Horn here that puts on a pretty good interpretation of a whale spouting. But we got something even better. Right out past the point here we spotted a couple of whales and then a couple more. We all stood and watched them as they moved northward along the shore. They all looked like adults. I guess it was a great day for whales because the folks working down at the lighthouse said that they’d seen 10 of them during the day. After a very enjoyable hike back up the hill to the Visitor’s Center we decided we’d take the short drive up to the parking area near what is called the Stone House and take the short hike out to the old CCC shelter for which it is named. We found a parking spot okay and then hiked along the trail which gives you a super view down to Devil’s Churn (the rocky formation on the lower right) and on south along the coast. 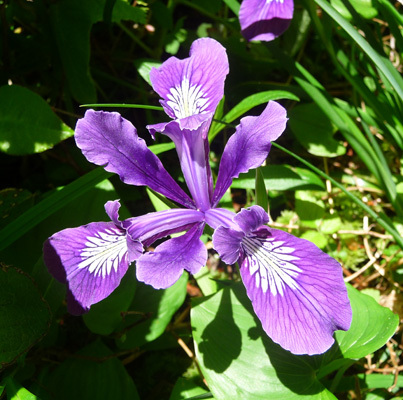 There were deep purple Douglas Irises (Iris douglasii) along the trail. And after a short walk we arrived at the Stone House built by the CCC in 1934. 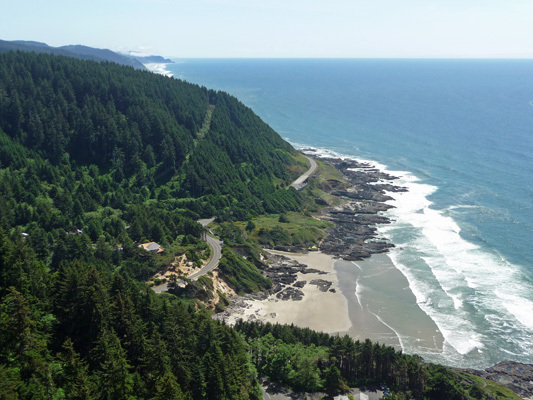 The view here spans 70 miles of coastline and 37 miles out to sea. 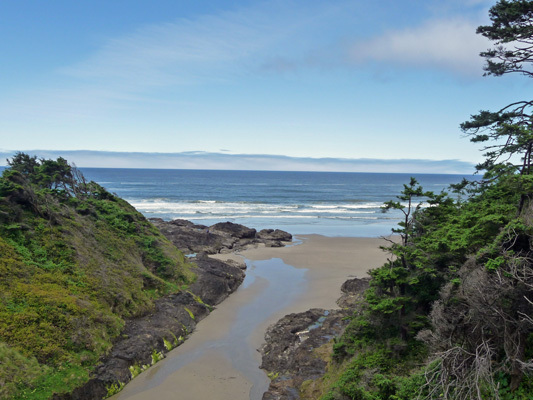 It’s said to be the ‘best view on the Oregon Coast’. That’s Heceta Head off in the far distance on the upper left. 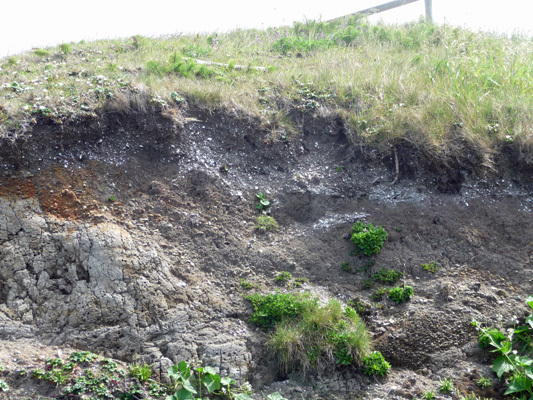 We could see a ridge further past it that didn’t show up in the photo. We found a bench in the sun and had our lunch looking at this lovely view. Life is good, don’t you think? 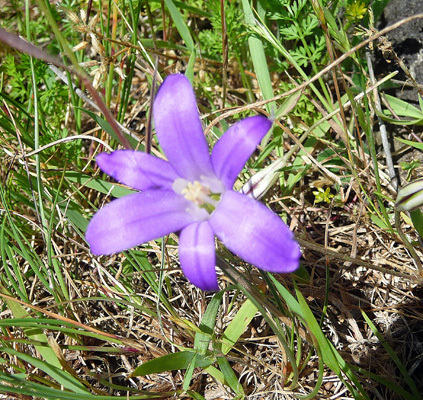 On the way back to the truck I noticed a scattering of Elegant Brodiaea (Brodiaea elegans) in bloom. 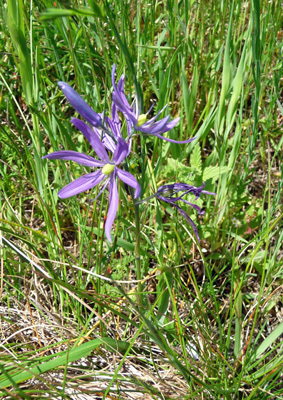 And amazingly quite a few Common Camas (Camassia quamash)--shorter than those I’d seen inland but clearly still camas. It was a great outing and wonderful weather for this time of year. One Tuesday morning we had sun yet again (even though the radio said it was supposed to be cloudy). 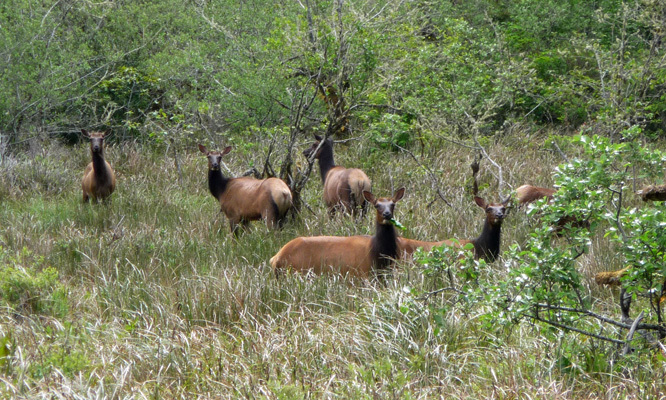 We headed into Florence to go to the library and do our grocery shopping and we spotted a small herd of elk right next to Highway 101. We turned around and found a place to park and I hiked back along the verge to grab some photos. There was even a bull in amongst all the cows. I counted eight but only managed to get 7 of them in this photo. 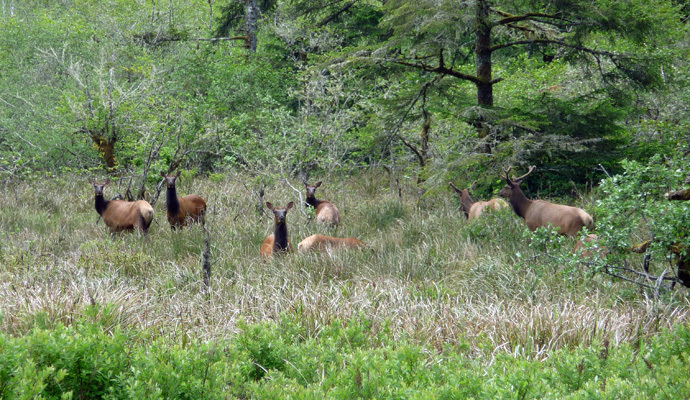 For lunch we drove out along the Siuslaw River (pronounced Sigh-Use-Law) hoping to find a nice pull out with a view. The tide was out so the pull outs had views of mud flats so we kept on driving all the way to Mapleton and then found a spot with a leafy view of the water along the south bank of the river. Wednesday was a monumental laundry day. I washed everything in sight and managed to spend 6 hours at it! Meanwhile we got all of our other trailer maintenance done so we’d be ready to take off on Monday to begin our drive to Idaho. That evening was the last host campfire and we sang “Happy Trails to You” and “So Long It’s Been Good To Know Ya.” I was pretty tired and had a bit of trouble with the chord changes in Happy Trails. But we got through it okay and even managed to get folks to sing along on So Long and that was a big win. 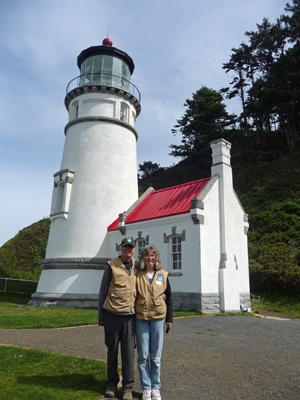 It was cloudy with a few sun breaks at the campground on Thursday morning May 28th but it was foggy up at Heceta Head when we hiked up to the lighthouse for the afternoon shift. We had a moderately busy afternoon each doing 5 or so tours a piece most of them with 4 or 5 people in a group. Late in the afternoon as the tide turned we had waves crashing up onto the rocks near the head. 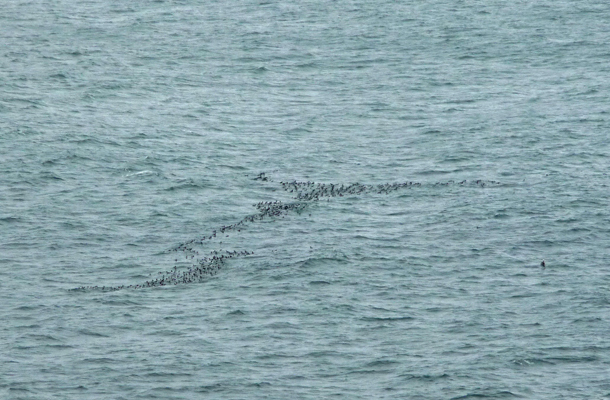 And we could see rafts of common murres swimming not far off of the rocks. They still hadn’t moved in to nest in their usual places on the rocks but we continued to see them swimming offshore. Sometimes they were close enough to hear them squawking and calling to each other. 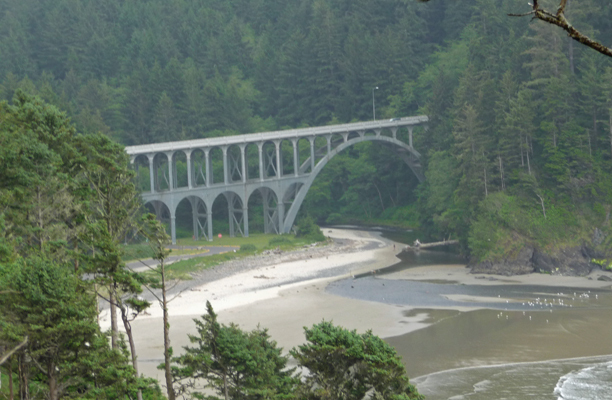 As we started down the hill at the end of our shift, I stopped to take a photo of the historic Cave Creek Bridge that spans the creek at the Heceta Head beach. 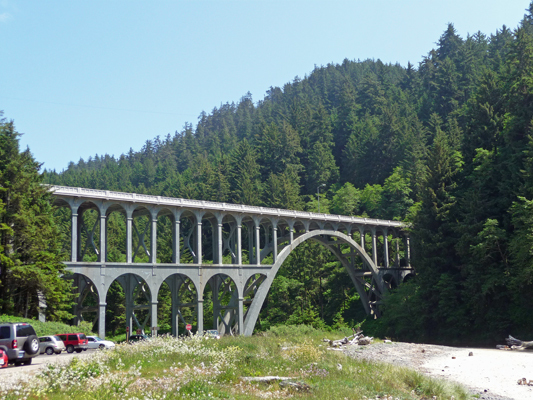 It was built in 1931 as part of the effort to complete Highway 101 along the Oregon Coast. Just south of it you go through a tunnel that takes you through the highest portions of the headlands and then the road turns southward along the cliffs. 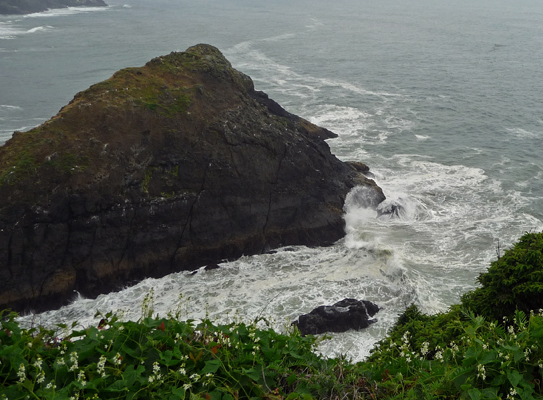 Friday May 29th, it was mostly cloudy and foggy both at the campground and at Heceta Head. We worked the morning shift and it was mostly quiet except for a little rush at 12:30 when we had about 20 people all arrive within about 10 minutes of each other. We got the ticket system out and got all set up to use and then didn’t need them again for the rest of the afternoon. We saw 4 whales (two moms with calves) at just before 2 pm when we were doing shift change—what more could you ask for? Saturday May 30th, we awoke to SUNSHINE. We had the morning off and puttered around home before heading up to the lighthouse to work the afternoon shift. It was a nice steady afternoon without huge crowds. We had 4 whales to start to the afternoon off (once again right around 2 pm) and then there was another sighting while I was up in the lighthouse later in the afternoon. I had two different tours where the people were THRILLED to be able to go up the lighthouse. One lady had visiting a lighthouse on her bucket list and one was someone who had been visiting the lighthouse for 60 years but had never gone up in it. Fun! At about 4:20 we were sitting on the bench with no one around when all of a sudden a HUGE crowd of well dressed 20-somethings—many with hats--came walking up the trail. They turned out to be an Instagram event. They took photos and asked us take photos of them but none of them took tours. Mostly they simply were meeting and greeting and looking beautiful. That was a first for all of us tour guides who now officially feel like old fogies! 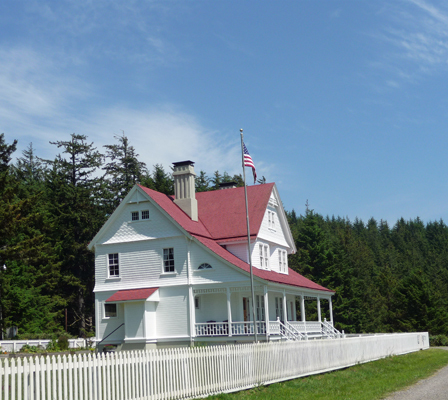 We awoke to a gorgeous sunny morning on Sunday May 31st, for our last day at the lighthouse. We were working the morning shift so once we were all set up, we had one of the other hosts (who is a very good photographer) take a photo of us in front of the lighthouse. Then we went into the tower and sang the rousing chorus from Stan Rogers’ Northwest Passage, a modern sea shanty sounding song. It was fun but not much better than singing in a bathroom but now at least we know what it sounds like to sing in there. We had a busy morning giving one tour after another with one or two groups of folks waiting most of the time. I think we all gave 6 tours a piece. I gave the last tour of the shift and it was nice to be able to note to myself and to the nice folks on the tour that this was my last tour there. We had rainbows in the tower off and on the whole shift (they come and go as the angle of the sun shifts and have appeared in different places at different times of the day throughout the month). 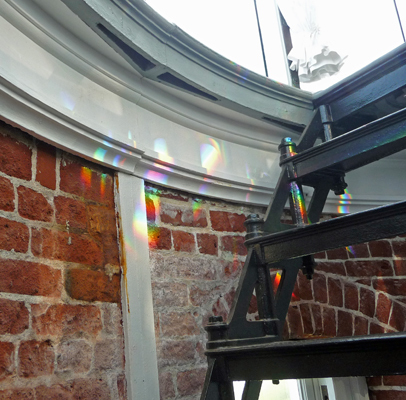 This particular afternoon we hit the jackpot and had clusters of rainbows at the top of the stairs up to the lantern. We said our good byes to the folks on the next shift and the headed down the hill for the last time. I stopped and took a photo of the assistant keepers’ house (now a B and B). We found a parking spot overlooking the beach and had our lunch. The gulls were splashing in the shallow water near the south end of the beach. And there were a few folks out enjoying the gorgeous day on the beach (there’d been a whole bunch when we arrived at 10:30). Then I turned around and took a beach level photo of the Cave Creek Bridge. Then we headed into Florence and stopped at the do-it-yourself car wash and washed the truck to remove the sea spray and pollen we’d accumulated in a month at the beach. This was a test case to see whether it would work for the trailer too--the plan being to take the trailer through in the morning on our way to Eugene. That done (without getting wet, huzzah) we did our grocery shopping and stopped at Fred Meyer one more time. There I picked up a weather station complete with anemometer (wind speed meter). I’d noticed one on a trailer earlier in the week and stopped and talked to the lady who owned it. She’d said she’d gotten at Fred Meyer and sure enough they had them. 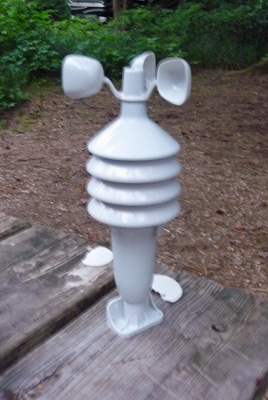 I’ve wanted this kind of weather station since I was a kid and it’s really cool to be able to have one that we can just leave out on the picnic table at our camp site. Since it’s wireless we end up with outdoor and indoor temps and humidity and outdoor wind speed (I guess they don’t think you need to no how much hot air is blowing inside). Monday morning we’ll pull up stakes for the first time in a month and motor into Eugene where we’ll pick up Walter’s guitar which has been in for repair. Then we’ll do some other errands and head further eastward on Tuesday morning. The plan is to arrive at Lake Cascade 70 miles north of Boise, ID on Thursday afternoon June 4th.